total VOC (TVOC) are often found in pollutants to be controlled in wastewater treatment plants. This family groups all the compounds found in gaseous phase and containing at least one carbon atom and one hydrogen atom. The family includes odorous compounds (including mercaptans, amines, aldehydes, etc. ), compounds harmful to the environment or human health (such as benzene and formaldehyde) and non-”pollutant” compounds (for example butane). Total non-methane VOC (TNMVOC) are singled out, i.e. VOC excluding methane, total VOC. Both reduced sulphur and nitrogen groups are responsible for the strongest smells found in urban water treatment plants that are not operated in conjunction with any industry or with sludge heat treatment. In the latter case, there may be strong odours caused by aldehydes. With these structures, the main danger lies in the potential transfer into the surrounding air of the unpleasant smelling compounds contained in the water to be treated. The properties and origin of this water are therefore decisive factors to be taken into account to assess the emission potential. When there are no industrial discharges in the wastewater network, the main gaseous pollutant in the raw water is hydrogen sulphide. This compound is formed in the networks upstream of the treatment plant by the anaerobic fermentation of the organic matter and therefore depends on the septicity (see oxidation-reduction-septicity potential), redox potential, BOD concentration in raw water and the ambient temperature, network length and the presence of intermediate lifting stations. Actions can be taken to limit the emission of hydrogen sulphide, i.e. by combating the formation of sulphides in the water by removing the anaerobic conditions: injecting an oxidizing (e.g. H2O2), injecting NO3– (anoxia and not anaerobia), or by precipitating S2– formed via ferrous or ferric salts. Stirring the water (lifting pump, agitation at the foot of the screens, bubbling in the grease removers), and water drops ­will tend to “strip” the volatile compounds dissolved in the water. An aggravating factor: recycling high loaded and septic liquor generated by sludge treatment to “the inlet”. At primary settling, odour emissions remain limited (drop at the weirs) and the concentrations measured are markedly lower than those found at the plant inlet. Nevertheless, fresh sludge pits still continue to generate quite strong odours. For facilities in countries with hot climates, sulphide concentrations in raw water can be high and generate far higher H2S emissions at pre-treatment than emissions encountered in countries with a temperate climate. These high sulphide concentrations in the networks are found in long networks with little activity (low water flow due to the availability of drinking water in the country). These high concentrations can be increased where seawater infiltrates the wastewater collection networks. They make little contribution to the emission of odours. for the load: low < medium < high (see water quality). The clarifier has virtually no involvement in odour emission when clarification is carried out correctly. Similarly, very few problems are created by any tertiary treatments. This is undoubtedly the source of the main olfactory compounds emitted by a water treatment plant. lime treatment alters the apparent solubility of acid and alkaline compounds. Thus, by increasing the pH , the sulphur products (acid compounds) are locked into the water in a (soluble) ionised form whereas the nitrogen compounds (alkaline compounds) are released. There are anaerobic areas at the bottom of thickening tanks and the acidogenesis phase of fermentation will produce volatile fatty acids. For dewatering, table 1 summarises the contribution to emissions depending on the type of dewatering and sludge quality. using olfactometric analyses based on human nose reaction and that can be used to quantify a perceived olfactory perception. In conjunction with dispersion models, these measurements can assess the olfactory impact. It involves analysing the stale air for the main odorous compounds emitted by the wastewater treatment plants, including those of the two most common families, ­reduced sulphur and nitrogen, and also the aldehydes and ketones and the total VOC parameter, which is an overall indicator of the pollutant load in the stale air. Sampling is extremely important if we are to obtain meaningful results. specific detectors (waste identification sheet, electrochemical sensor). 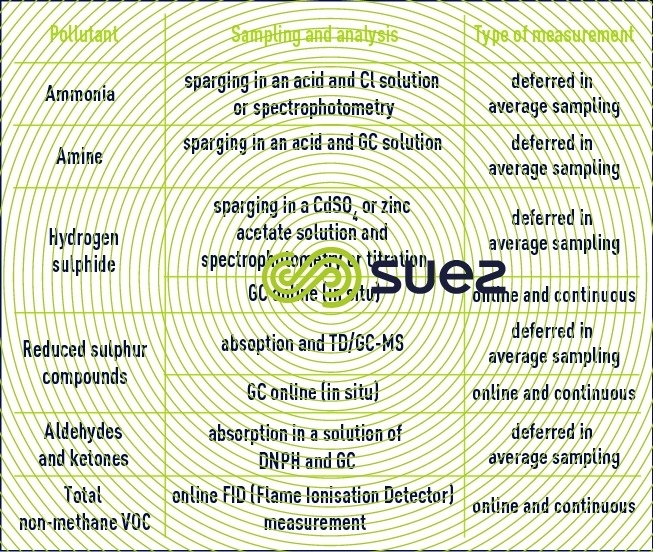 The main methods traditionally used to characterise the odorous compounds in a treatment plant are set out in the table below. A qualitative and quantitative knowledge of what makes up the atmosphere will not be enough to ascertain the odour properties of the mixture (human nose perception) created because of the “synergy” or, on the contrary, of the “masking” effects. Furthermore, some odour-emitting products are perceptible at such low concentrations that even the most efficient analysers are often incapable of detecting them. measuring an “atmosphere’s odour intensity” expressed in relation to a scale of reference. odour intensity is used to quantify the force of the perceived sensation and applies rather to the characterisation of odours in the environment. Always a crucial matter, the NF EN 13725 standard describes the method used to take samples of odorous atmospheres. The odour concentration measurement is standardised in Europe (EN 13725). This measuring method refers to international practices. The odour concentration represents the dilution that must be made to an odorous gas so that it is only perceptible to half the population. After having been diluted by an appropriate odourless gas, the odorous mixture is presented to each of the panel members who each individually states whether or not he has perceived the odour of the mixture. Based on a series of trials, the individual perception threshold is defined for every member of the nose panel. The panel's perception threshold is then calculated based on individual thresholds (geometrical average) after verifying the homogeneity of responses from panel members. The measurement requires an olfactometer. The olfactometer is a device that allows to control the dilution of the odorous mixture with the odourless gas and to present the diluted mixture to the panel member. Only dynamic olfactometers are used. It must be possible to rapidly vary the dilution level between 10 and 10,000. This requires a device comprising three interchangeable channels (two for the odourless gas and one for the gas to be tested). The recommended flow rate is approximately 2 Nm3·h–1. The olfactometer is therefore a measuring apparatus that uses the human nose as a detector. The odour concentration measurement requires a nose panel of at least four members; a strict protocol verifies their olfactory normality in advance. The responses from the panel members must be homogeneous according to set criteria for each measurement. The responses from additional members are incorporated where there is a lack of homogeneity. The odorous intensity of an environment is the intensity of the sensation produced. It depends on the concentration of the odorous mix, but the intensity/concentration relationship is complex and non-linear. Odorous intensity is normally measured using arbitrary units and psycho-physical measurements carried out by a panel of experts whose responses are processed statistically. In France, the odorous intensity measurement is based on an olfactory equivalence method (AFNOR standard NF X43-103). The measurement method uses a range of reference intensities produced by means of several samples containing either 1-butanol diluted solutions, or pyridine diluted solutions. The measurement consists in comparing the intensity of the odour perceived against the intensity of the samples taken from the reference range. It is carried out by a nose panel with at least seven members. The measurement can be carried out direct in the environment concerned. Responses given by panel members are confidential. Results are processed statistically. By definition, the log of the mean value of the odorous intensity of an atmosphere is the arithmetical mean of the N values of their log. The confidence interval calculation is based on this figure. The probability level selected is equal to 0.95, i.e. the actual value of the intensity has a 95% chance of falling within the interval of confidence. The odour flow rate of a channelled source (a chimney, for example) is, by definition, the product of the air flow rate from this source expressed at 1 atmosphere and 20°C (normal olfactometry conditions) and its odour concentration. For passive (non-ventilated) surface sources, the odour flow rate is proportional to the tank’s free surface area. This flow rate is quantified by measuring the odour concentration in a sample of air taken in the tank using a flux chamber that isolates the sampled surface from outside conditions. If we know the odour flow rate for a source, using atmospheric dispersion models, the area of impact can be determined, within the threshold distance (distance at which the odour is only perceived by half the population, i.e. 1 ouE/m3). These are intended for use as part of an evaluation that is as quantitative as possible of the odour level in a given area. This level is measured using the odorous intensities measured by a group of trained ­observers. a qualifier (industrial, urban, agricultural, etc. odour). Results can be presented as charts into which are entered the mean figures for the intensities perceived. These measurements, that can be reproduced, are used to compare the olfactory situation before and after installation of a plant or of a wastewater treatment plant, for example. In order to evaluate the level of inconvenience experienced by populations close to a site, we can use volunteers selected from the local population, through the odour observatory. Based on the physiological reactions of a group, these olfactory methods are undoubtedly the most representative of perceptions and, where applicable, of discomfort felt by operators or by those living in the vicinity of a water treatment plant. Olfactometric measurement methods are expensive methods due to the number of “expert noses” that have to be gathered and of the meticulously reproducible nature of the results to be obtained. The olfactometric measurements are used to put the sources in order of priority based on their potential olfactory impact and therefore to define the sources to be odour-controlled, whilst the chemical measurements are used to direct and design the odour treatment processes.